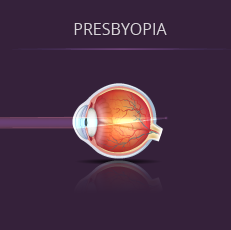 Presbyopia is a condition that typically becomes noticeable for most people around age 45. In children and young adults, the lens inside the eye can easily focus on distant and near objects. With age, the lens loses its ability to focus adequately. Although presbyopia is not completely understood, it is thought that the lens and its supporting structures lose the ability to make the lens longer during close vision effort. To compensate, affected individuals usually find that holding reading material further away makes the image clearer. Ultimately, aids such as reading glasses are typically needed by the mid-forties. Besides glasses, presbyopia can be dealt with in a number of ways. Options include monovision and multifocal contact lenses, monovision laser vision correction, and new presbyopia correcting implant lenses. All people will experience difficulty reading, usually beginning in their 40s. There is a lens in the eye which”accommodates” light so that we can see at near distances. As light from a near object enters the eye the cornea refracts the light and the lens changes shape to accommodate for the decreased focal length of a near object. This is exactly the same process that occurs when focusing your camera on a near object. Unfortunately, this lens within the eye, as it ages, loses its ability to focus for us and we need reading glasses or bifocals. Presbyopia can be dealt with in a number of ways, so please contact our staff to better understand your options if this is something that you think you are experiencing. You can also click here to learn more about our Clear Lens Exchange procedure, which can treat presbyopia.